Double Jeopardy (11m1s, HD) Interview with Mark Soper. He plays the adult twins in the movie. He talks about how he loves working on low budget movies because he gets to experiment with his character (here he had two to experiment with). He also talks about how he had a blast making the movie. Jeez, Louise! (10m 21s, HD) Interview with Actor Louise Lasser. She plays the mother in the film. She talks about her career leading up to Blood Rage. She talks about how she wasn't sure about here character because she felt that she was playing it too over the top, but the director kept telling her that she was right on. She says that she would add things to see if they would make it into the movie (most of them did.). Both Sides of the Camera (10m 21s, HD) Interview with producer/actor Marianne Kantor. She didn't plan on being in the film, but the actor they cast in the role never showed up, so she had to jump in and do it. She also talks about how she raised the money for the film (she promised her investors that she would pay them back in full before she touched a cent for herself.). She also talks about shooting the film and losing the director, only to gain another one (who was terrible) and having the director come back and finish shooting. Man Behind the Mayhem (12m 48s, HD) Interview with special effects creator Ed French. He talks about getting his start by working on student films to hone his craft. He then spends a majority of the interview going over each set piece. He is proud of his work on the film, but doesn't like working on horror movies anymore. He stays away from them. Three Minutes with Ted (3m 18s, HD) Interview with Ted Raimi. He's barely in the movie, a one scene, no dialogue role. He did the movie because of a deal that he made with his father. That is it. The interview is just as lone as his scene in the film. Return to Shadow Woods (5m 36s, HD) Ed Tucker, film historian, takes us on a tour of almost every location used in the film. I liked this a little bit better than the similar Horror's Hallowed Grounds. 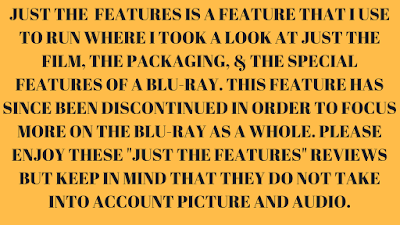 This featurette doesn't BS around. It gets to the point and doesn't overstay its welcome. VHS Opening Titles (5m 1s, SD) Not much is changed here, but this is the only time that we see the Blood Rage title card. The version of Blood Rage on this disc has a title card that reads Slasher. Behind-the-Scenes Gallery (4m 31s, HD) This is how a gallery should work. They give us the still images like any other still gallery we have seen, but here they play the score over the images. Commentary with John Grissmer and the film's co-owner John Daley, with moderation by Arrow's own Ewan Cant. Grissmer couldn't care less. He refers to the film as a "job of work" and gives some of the shortest answers I have ever heard. It just seems like he is there to pick up a check. Daley and Cant try to keep the commentary moving, but Grissmer just keeps messing things up. Takeout Grissmer and this could have been a solid track. 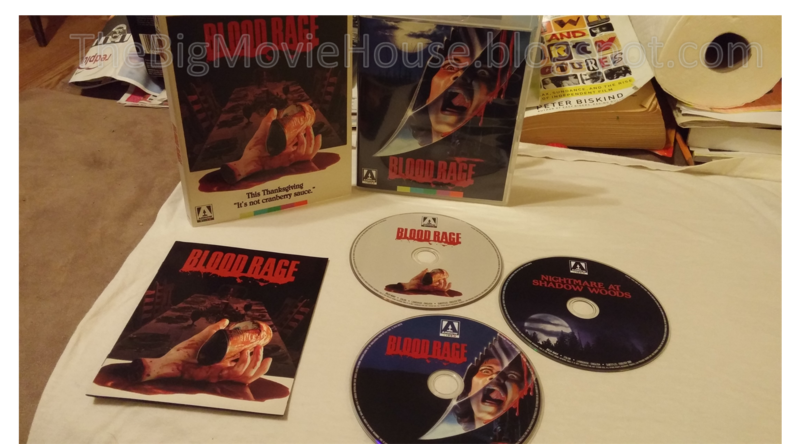 Composite Cut: This takes the scenes that are in the theatrical version and combine them with Blood Rage to give us a more robust film. This cut doesn't really add anything that is vital, but it is a nice addition to have. Outtakes (26m 39s, HD) There is no sound as it has been lost, but it is still nice to see raw footage. 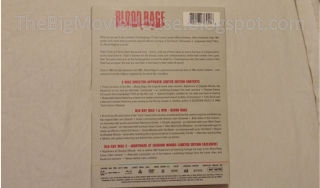 Disc Three: DVD copy of Blood Rage with all the special features from the Blood Rage disc. Overall: I love Blood Rage. I am going to get a full review up some day. The blu-ray from Arrow is damn near perfect. The interviews are all interesting and fun to watch and the look back at the locations featurette is really good. Having the two released version of the film with a third version that combines the two versions is nice. The only thing bad that I can say about this edition is the commentary is really lacking. That is not a fault of Arrow's so much as it is the commentators. They could have done something to limited the director's involvement. Other than that this is a fine edition. Arrow has also gone above and beyond with the packaging. They could have given us a standard slip sleeve and that would have been fine. Arrow is too smart for that. They gave us a nice package. First up is the slip sleeve. This is a thing of beauty, The slip is matted and feels nice. There is some embossing, but not too much. 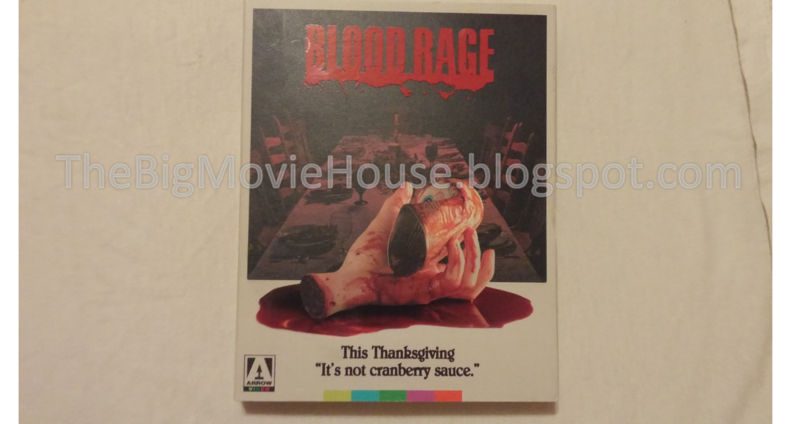 When I hold it in my hand, I feel like I am holding a VHS copy of the film. Brings back some nice memories. Next up we get a thick case that are like the ones used in the UK. The case has very nice cover art, but if you don't like it you can flip the cover art around and there is another cover. Nice. We get three discs: 2 blu-rays and 1 dvd. 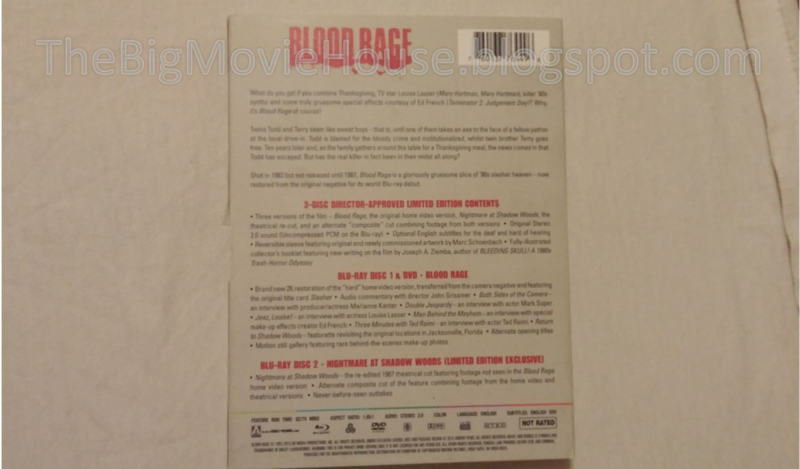 We also get a booklet with an essay written by Joseph A. Ziemba, co-founder of Bleeding Skull, a website that specializes in forgotten horror movies. We also get some info about the transfers used for the different cuts of the movie. 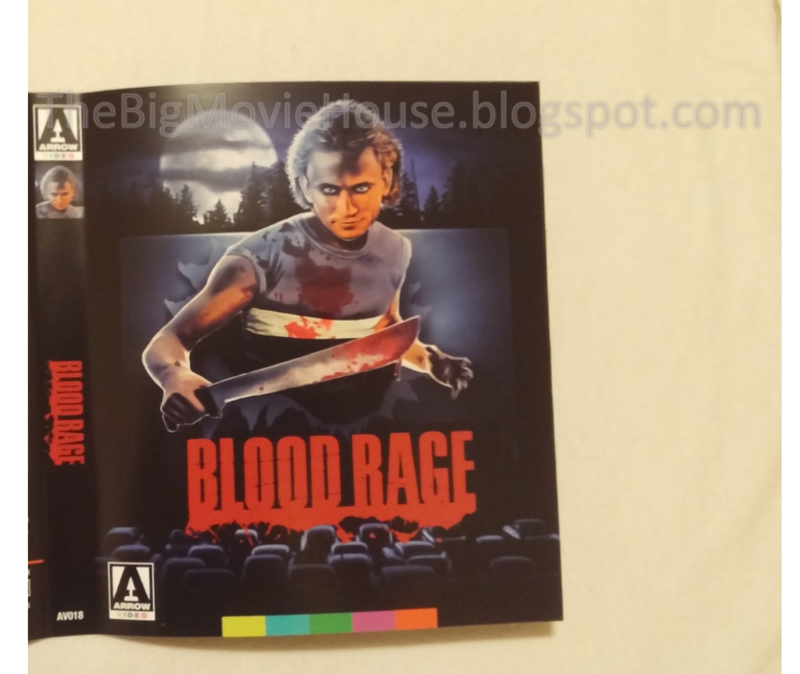 Arrow Video has gone to no end to bring us the best package that they could. I had never heard of the movie until Arrow announced that they were releasing it on blu-ray. 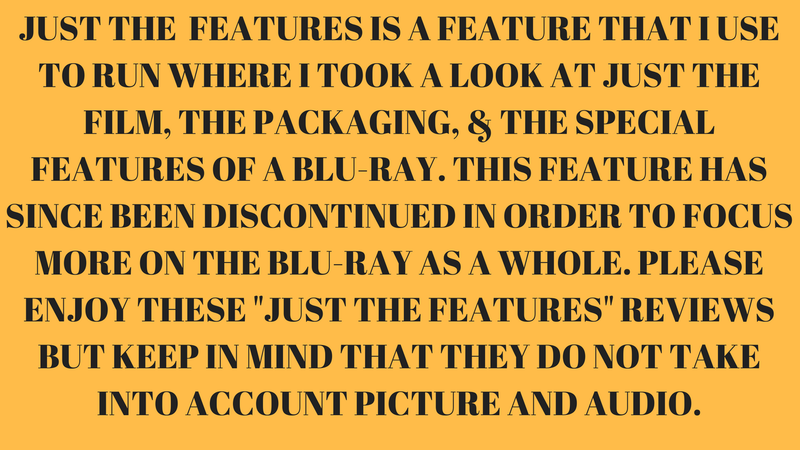 The movie looks great and the special features are well done and thorough. 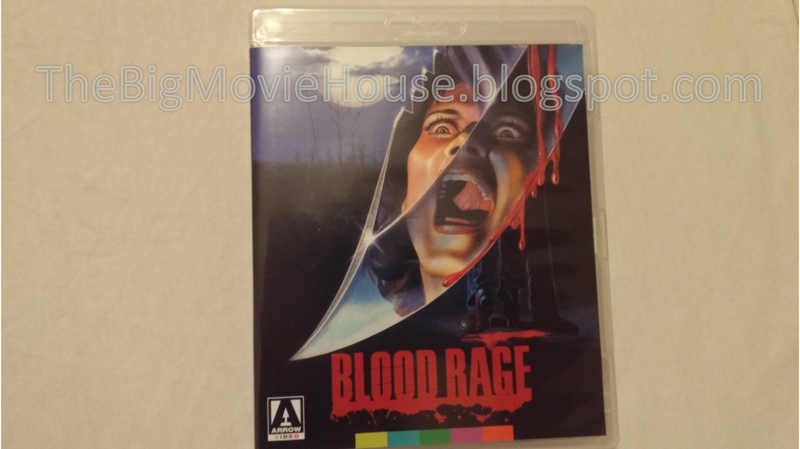 I wish that more movies would get the love and attention that Arrow gave Blood Rage. I think that the world would be a better place if they did.